Our best selling 3 bedrooms with study on the main level, now available on this beautiful wooded lot. Home to be situated 60' up off the street on the flat area in the middle of the lot. Drive to 45 degrees across lot from left to right for soft easy access. Will have lots of light when complete, with removal of trees are removed from build site and driveway. Absolutely beautiful setup! We have a Windsor Ranch fully framed out and available to view nearby. 3rd bedroom can be modified for whatever you would desire, such as expanding Master bath and closet and/or creating closed off laundry area, just to name a few. Garage to be our new L-shape, not the 3 bay facing the street as shown in color rendering. All bedrooms are a very nice size with a huge Master Suite and beautiful open area from Kitchen thru to Grand Room. 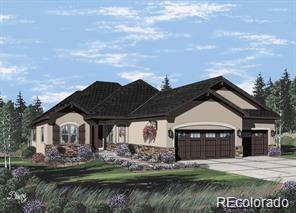 Go to Ranchliving.net to see the Windsor Ranch floorplan.